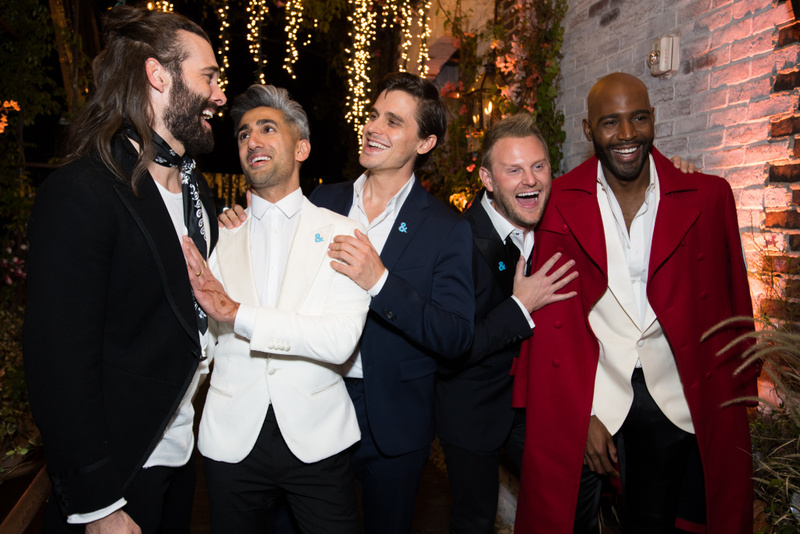 (L-R) Jonathan Van Ness, Tan France, Antoni Porowski, Bobby Berk, and Karamo Brown attend the after party for the premiere of Netflix's "Queer Eye" Season 1 at the Pacific Design Center on February 7, 2018 in West Hollywood, California. Netflix rebooted Bravo’s hit show “Queer Eye for the Straight Guy” – but the new season is about more than setting up straight guys for success with women. The original show premiered in 2003, five years after “Will & Grace” introduced gay leading men to primetime television. And though “Queer Eye for the Straight Guy” was inherently significant for starring five openly gay men on cable TV, it focused solely on heterosexual romance and avoided diving into societal tensions surrounding sexuality. Now titled only “Queer Eye,” the Netflix reboot has broadened its scope to include its first gay contestant, who works with the Fab Five in a heartwarming episode to finally come out to his stepmother after his father passed away. (He’s now engaged to his long-time boyfriend.) Though it’s still a makeover show at its core, the reboot features genuine conversations about masculinity, race and self-acceptance. If you are a member of the LGBTQ community, what did “Queer Eye for the Straight Guy” mean to you when it premiered in 2003? How do you feel about the Netflix reboot? Call us at 866-893-5722.